The Pekingese is an ancient breed of toy dog, originating in China. They are called Lion Dogs due to their resemblance to Chinese guardian lions (the Shih Tzu is also known as a Lion Dog in Chinese). The Pekingese’s flat face and large eyes are some of the breeds most obvious characteristics. The body is compact and low to the ground. 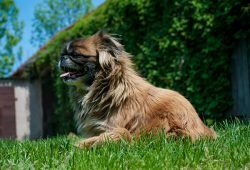 Pekingese also have a muscular and durable body. The breed’s unusual rolling gait may have been deliberately developed by breeding to prevent the court dogs from wandering in ancient times. All breed standards allow a wide range of color combinations. The majority of Pekingese are gold, red or sable. Cream, black, white, sables, black and tan and occasionally ‘blue’ or slate grey have appeared in the breed. The latter often has poor pigment and light eyes. Albino Pekingese (white with pink eyes) should be bred cautiously due to health problems that have been associated with albinism. The Pekingese sheds a lot. A black mask or a self-colored face is equally acceptable in show dogs. Regardless of coat color, the exposed skin of the muzzle, nose, lips and eye rims is black. The Pekingese weigh from 7 to 14 lb (3.2 to 6.4 kg) and stand about 6–9 inches (15–23 cm) at the withers, however they can sometimes be smaller. These smaller Pekingese are commonly referred to as “Sleeve” Pekingese or just “Sleeves”. The name is taken from ancient times, when emperors would carry the smallest of the breed in their sleeves. A Pekingese over 15 pounds is disqualified in the show ring. The Pekingese has a median lifespan of 11.4 years in a UK Kennel Club survey. It is normal, however for them to live anywhere between 12 and 15 years.